In September 2013, Arkansas became the first state in the nation to receive approval from the federal government for a Section 1115 demonstration waiver to require most adults who are newly eligible for coverage through the Affordable Care Act's Medicaid expansion to enroll in Marketplace plans. The initiative, often referred to as the "private option," has allowed Arkansas to cover close to 220,000 Medicaid beneficiaries with commercial provider networks and strengthen its Marketplace. An additional 25,000 medically frail adults are covered through the state's fee-for-service system, bringing to 245,000 the number of newly eligible adults covered in Arkansas as of June 30, 2015. As a result of this coverage, Arkansas has been able to drive down its uninsured rate and reduce uncompensated care costs. 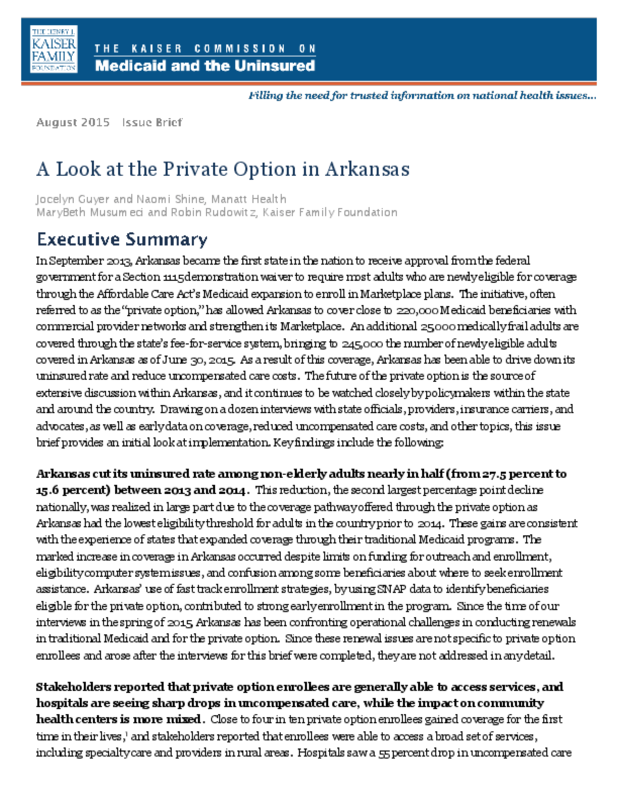 The future of the private option is the source of extensive discussion within Arkansas, and it continues to be watched closely by policymakers within the state and around the country. Drawing on a dozen interviews with state officials, providers, insurance carriers, and advocates, as well as early data on coverage, reduced uncompensated care costs, and other topics, this issue brief provides an initial look at implementation. Copyright 2015 Henry J. Kaiser Family Foundation.